​2018 marks the 40th anniversary of the opening of the Sainsbury Centre for Visual Arts, the first public building designed by the world-renowned architect Norman Foster. 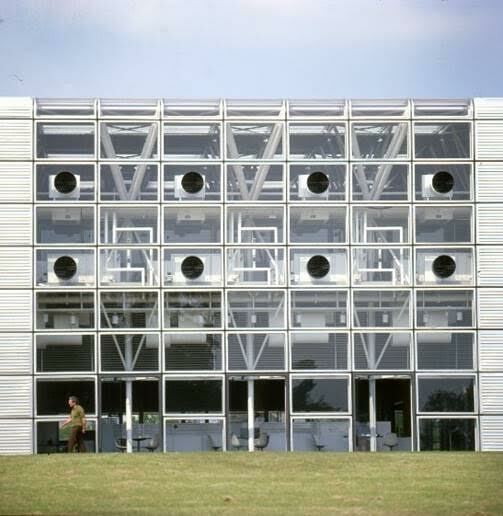 In celebration, the Sainsbury Centre is launching a major exhibition to shine a light on developments in architecture from the 1960s to the 1990s. SUPERSTRUCTURES tells the story of architecture's fascination in the post-World War Two decades with new technology, lightweight structures, pioneering building techniques and innovative engineering solutions. Discover how the Sainsbury Centre was made and how earlier feats of engineering, such as The Crystal Palace, inspired Superstructure galleries, factories, offices, transport hubs and homes. Encounter a range of fascinating objects from drawings and paintings, furniture and product design to photographs and film. Rarely seen together, a selection of iconic models will also be on display, including the Pompidou Centre by Richard Rogers and Renzo Piano; International Terminal Waterloo by Nicholas Grimshaw and the Hopkins House by Michael and Patty Hopkins, and a brand new three-metre-long model of the Sainsbury Centre. Renowned for co-creating the hit 1980s and 1990s television series Spitting Image with Peter Fluck, Roger Law has been a seminal British artist and cultural commentator for the last four decades. He has subsequently become a major ceramic artist, establishing himself as a pioneering figure in his work in Jingdezhen, one of China’s most famous porcelain centres. Roger Law: From Satire to Ceramics, opening on 18 November explores the full range of Law’s extraordinary career, in an exhibition that looks at his artistic and intellectual formation, and the successive environments he worked in. Russia Season: Royal Faberge and Radical Russia In October 2017, to mark the anniversary of the Russian Revolution, the Sainsbury Centre will stage the Russia Season. A highlight will be the dramatic model of Tatlin’s Tower, one of the most iconic architectural projects to have been designed in the Soviet era. The ten-metre high model will be on display near the Sainsbury Centre. contrasting Russian art and life, before and after the Revolution. Royal Fabergé explores the extraordinary production and glittering saga of Fabergé, the leading artist-jewellers during the decades preceding the First World War. A highlight will be the Sandringham animals illustrating the naturalistic genius of Fabergé which so appealed to Royal tastes both in Britain and in Russia.